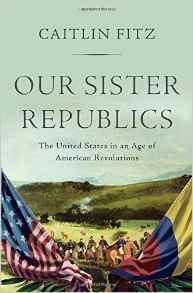 Young, breakout historian Caitlin Fitz investigates the oft-neglected period between the Revolution and Civil War in a thrilling reinterpretation of early U.S. history, tracing shifting American attitudes toward revolutions south of the border in Our Sister Republics: The United States in an Age of American Revolutions. The turbulent half-century following the American Revolution led one Kentucky congressman to declare this period “the jubilee of nations” as British, French, Spanish, and Portuguese colonies echoed the United States in quests for independence. At first, these movements were generously (and self-servingly) celebrated as “glorious tropical reprises of 1776.” Americans feted their republican brothers in Mexico, Peru, Colombia, Chile, and Brazil by naming their livestock, their sons, and their towns after Spanish-speaking statesmen; Andrew Jackson even named his prize colt “Bolivar” during the heated 1824 election. This exhilarating period was cut short in the 1830s when—in the wake of antislavery revolts in Latin America—it became clear these movements were as much antislavery as anti-imperial; in an ominous change of heart, the United States turned southward to discover a foil rather than a mirror. And in becoming a moderate exception to a hemisphere of brazen radicals, the United States justified a growing rhetoric of inequality. CAITLIN FITZ lives in Evanston, Illinois, where she is assistant professor of history at Northwestern University. She has received numerous honors, including a Fulbright Fellowship, an Andrew Mellon Fellowship, and Yale University’s Egleston Historical Prize. DEADLINE FOR REGISTRATION: Thursday, March 9, 2017.